HEMMED in from raising value-added tax (VAT), personal income and company taxes, Finance Minister Pravin Gordhan played his trump card in introducing carbon tax to the South African fiscus, Rhodes Business School tax professor Matthew Lester said. Addressing clients from professional services firm BDO, Lester said Gordhan delivered "the most significant budget ever seen" in the light of South Africa reaching the point where the game plan was not working and needing to find another pillar from which to draw revenue. "Energy will be the fourth big tax coming on a weak local currency, increasing energy prices as Eskom gets its tariff hikes and the implementation of carbon taxes at R120 per ton effective January 2015. This is despite the anomaly that only R6bn of an R898bn budget is allocated to environmental issues," he said. Until 2005 energy prices had kept track with the consumer price index (CPI), but were now escalating exponentially from that base. Consequently, South Africans had to change their mindset from earning and spending more to considering their energy costs - from the gas-guzzling cars driven to their business and home consumption habits. He said on the face of it, the budget appeared to let off taxpayers as Gordhan bowed to trade union demands that VAT rates remained untouched; company tax rates had not risen and personal tax levels had been adjusted for fiscal drag albeit predominantly in the lower income brackets. The fuel levy and sin tax increases were also below those imposed last year. This was despite South Africa achieving a lower-than-anticipated economic growth rate at 2.5% and tax rates only increasing in line with inflation. Personal income tax was picking up the slack from falling company revenues with the year to February 2013 expected to show a R16.3bn decrease on corporate tax collections. "It is a deficit that has not happened to South Africa since Barend du Plessis was Finance Minister (between 1984 and 1992) and the country cannot afford another two downgrades from the international rating agencies. If that came to fruition, South Africa would become a junk stock," Lester said. While Marikane cost the fiscus R29bn, only 5% of South Africa's taxes originate from mining. Financial services, insurance and real estate account for 29%, but around a third of companies are still in assessed loss positions following the global financial crash. The country also had too few taxpayers so fiscal drag on personal income tax could only be adjusted for the bottom end. While the country has 13 million people registered for tax from a 52 million-strong population, only 3.8 million were over the tax threshold and thus contributing to the fiscus. One frightening statistic was that social grants were climbing annually by 600000 to 700000, but the majority were child grants - a payment that fell away once the recipient reached aged 18 years. "Gordhan recognised that personal and corporate taxes were fully mined, making his question 'where to from here? '," Lester said. South Africa had promised the rating agencies it would keep borrowings below 5%, but the budget broke that guarantee and only promised to return to those levels by 2016. While international attention during the South African budget was focused on the Italian elections and their implications for the euro zone, Lester questioned the implication this announcement would have once world eyes returned to local markets. The country was no longer offering the same risk returns, potentially prompting international investors to seek out better opportunities elsewhere. "Businesses and families take note - the rand is vulnerable; carbon taxes are on their way and energy prices are rising steeply. Gordhan has established a fourth pillar of taxation and it will have a substantial impact on everyone, so the question arises on how to find ways of living on less energy," Lester concluded. 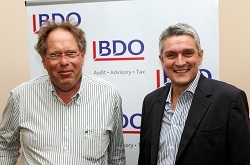 Professor Matthew Lester is pictured with Mark Stewart, BDO Durban Managing Partner.